Looked like a ton of fun! I'm hoping to get down to the Badlands park here in Western Indiana shortly after getting the axles finished; Hopefully sometime this fall. I ordered Dana/spice Ball joints for mine. Again. Hopefully these will last more than a year. I was looking at your build thread and noticed your black antenna mount. It was interesting because is was enclosed. Seems it would be better so it would not catch on anything. How has it held up for you. What is the make and model. Where did you get it. Is it still on your rig? I purchased it at a local CB shop. It's a fender mount. I don't recall the name brand. I kinda broke it when I laid my jeep on it's side doing "50' of fun" at Doe Valley off road park. But, I would expect that! It only cracked the inner part. I tried to JB weld it. which would have worked but I always kept an american flag attached to the top of my 3' firestick, which was attached to a CB mount spring and 60 MPH down the highway cracked it again. Overall I was really happy with it and the location. We had some really strong winds a couple months back, that coupled with highway speeds and the flag, and the spring mount broke. The fender mount was fine! Now I gotta buy another firestick. I miss my flag! 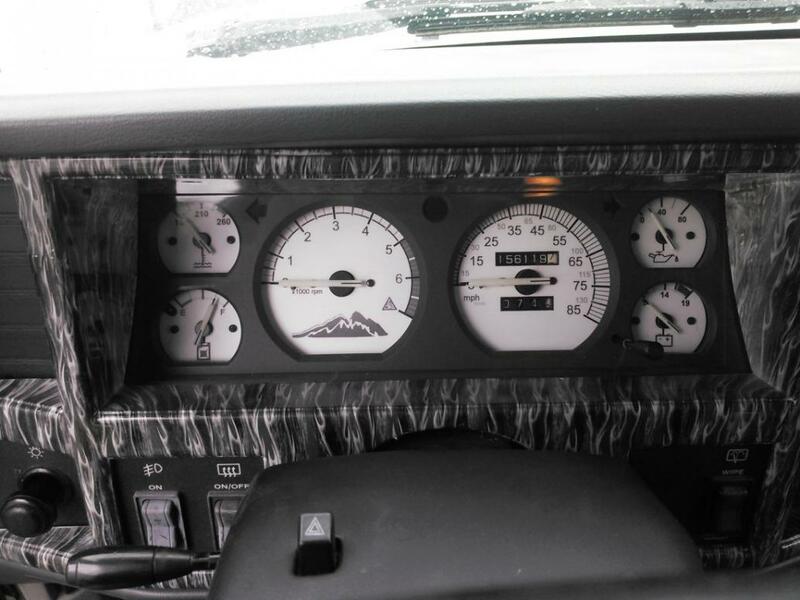 I like that Azzy's Gauge Light Kit install. 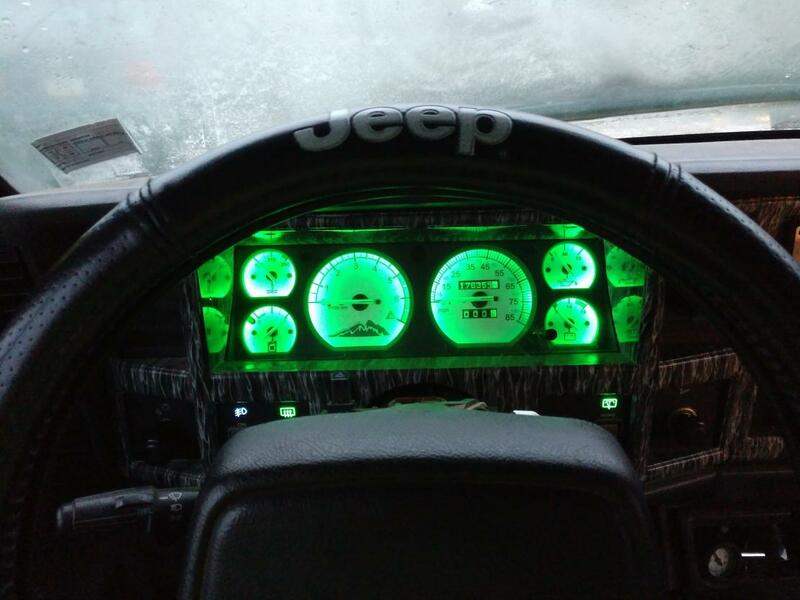 Did you also do the LED upgrade. Do you have a pic of what it looks like lit up at night? Last edited by Gluckmysock; 03-23-2019 at 07:52 PM. Is that Dash skin something you can buy that is previously made? I wonder if there is a camo one. I just ordered the Azzy's guage kit. I was debating on which White Gauge Kit I wanted. I had seen a sample of the one that was blue and red. I am glad I was able to see the one you have. It helped me make my decision. Thanks. Last edited by Cherokee4LIF3; 03-23-2019 at 10:36 PM. That "skin" is hydrodipped in "Ghost Flames". A buddy of mine does it. I put that in the one of a kind category. 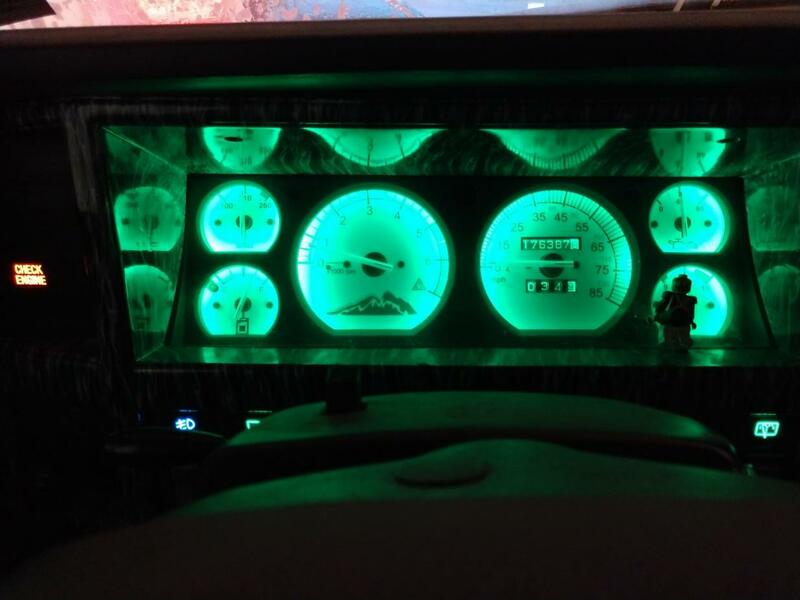 Also, I noticed the panel inside the instrument cluster you have is black. I was looking at mine and it was grey. Did you paint that or did it come that dark? Dang that was a long time ago, I'm pretty sure one was black and the other grey. And I just switched them. I think I did that when I had them hydrodipped. I'm like that at this point. Lots of little projects I forgot that I ever did.